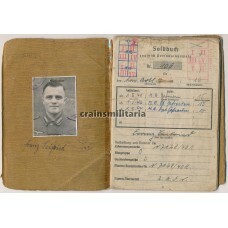 Soldbuch to Marineartillerie-Hauptgefreiter Franz Siefried. 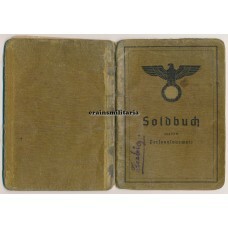 When his Soldbuch was opened in May 1941..
Soldbuch to Unteroffizier Herbert Gronow. 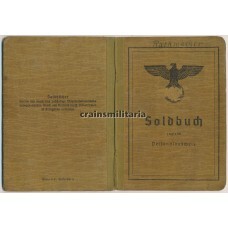 Zweitschrift issued in September 1944 while recovering fro..
Soldbuch to Gefreiter Paul Dün (?). 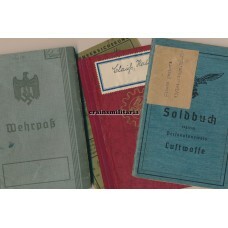 After some time with Grenadier-(Feldausbildungs-)Regiment 635 ea..
Soldbuch to Obergefreiter Bernhard Holbeck. 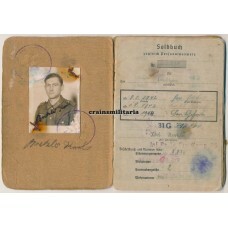 This carpenter from Essen received no less than seven "S..
Soldbuch to Schütze Josef Bierl, who joined the Wehrmacht in December 1941. 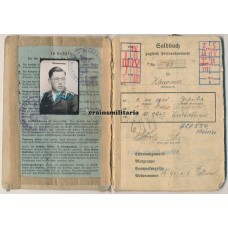 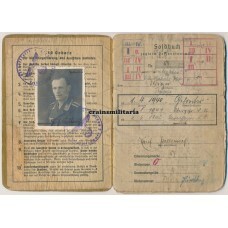 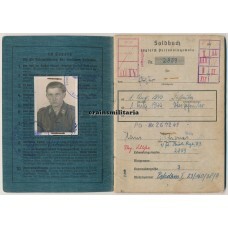 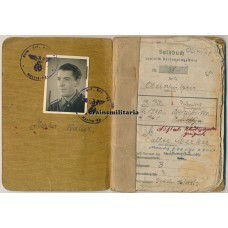 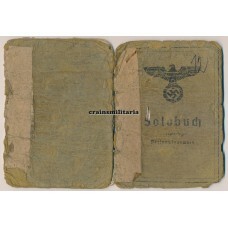 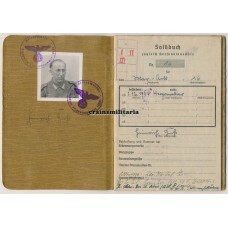 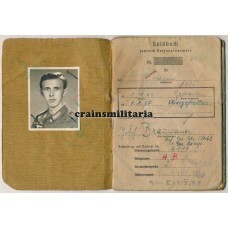 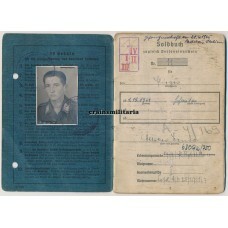 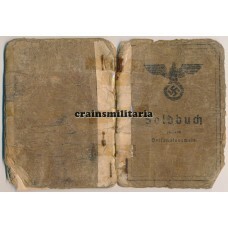 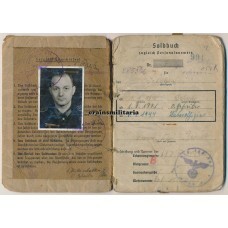 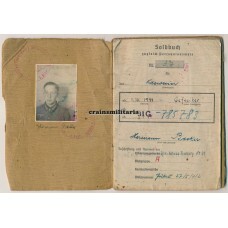 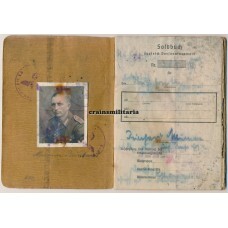 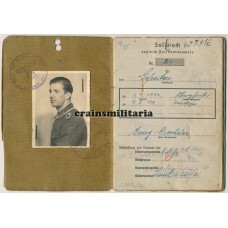 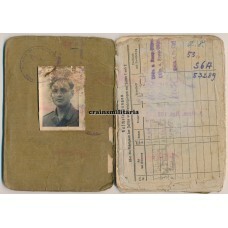 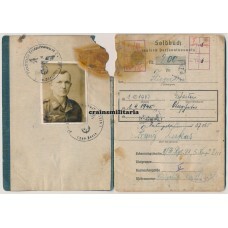 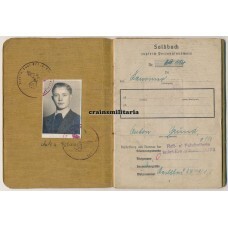 After his basic Grenadie..
Soldbuch to Kraftfahrer Erich Piotrowski from Berlin, issued in Sorau, September 1944. 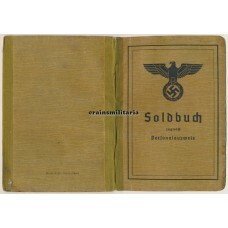 Piotrowski se..
Soldbuch to Gefreiter Simon Bader. 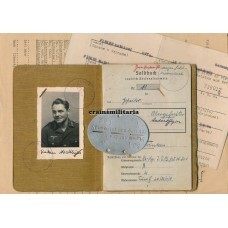 From 1941, he served mainly with Artillerie-Regiment 253, part of..
Soldbuch to Obergefreiter Georg Ingerling. 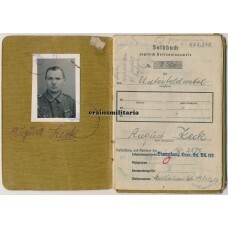 First issue opened in February 1941. 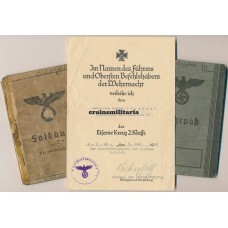 Ingerling served as ..
Soldbuch to Obergefreiter Kurt Bever. 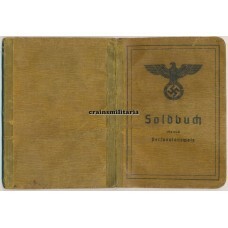 This Zweitschrift example was issued on 14th of November 1944,..
Soldbuch to Sanitäts-Gefreiter Karl Bretzler. 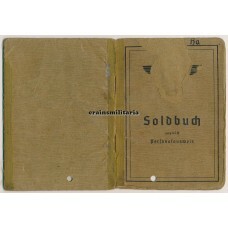 The Soldbuch was opened on 13th of May 1941. 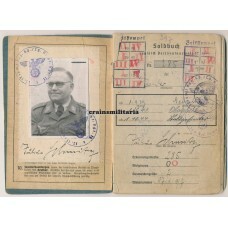 After ser..
Soldbuch to Gefreiter Hermann Becker. 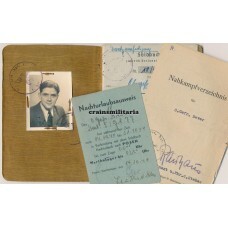 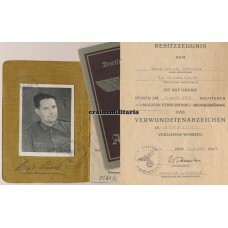 This young NCO candidate's Soldbuch was opened just a few week..
Soldbuch to Gefreiter Johann Kaiser. 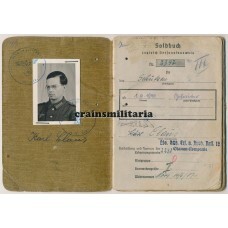 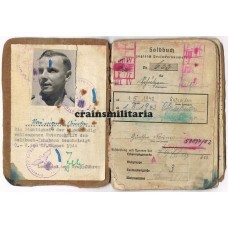 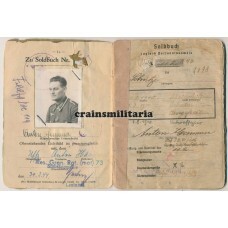 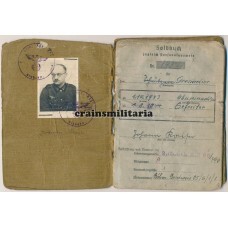 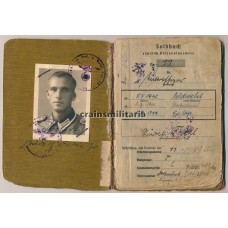 Originally a civilian employee with the Wehrmacht, he was draft..
Soldbuch to Obergrenadier Heinrich Buss, issued in the days when he was a Marine-Artillerist with th..
Soldbuch to the very young Grenadier Georg Boros. 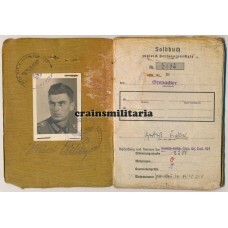 Born in 1927, he was transferred to the Wehrmacht ..
Soldbuch to Handwerker Kurt Rosomm. 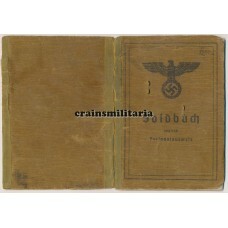 First issue from October 1940. 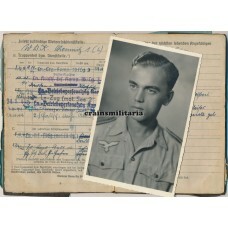 This car mechanic from Berlin con..
Soldbuch to Grenadier Josef Junker, who joined the Heer as a 17-year-old boy in June 1944. 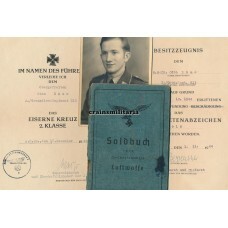 While sti..
Soldbuch to Unteroffizier Kurt Fiebig, a WWI veteran who served the entire war with supply and drivi..
Soldbuch to the young Grenadier Johann Feichtner, who fought with the 3. 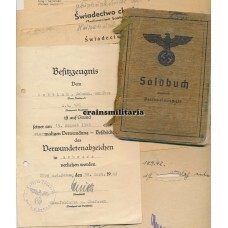 Kompanie of Festungs-MG-Bat..
Soldbuch to Obergefreiter Franz Schmitz. 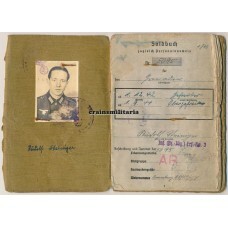 Zweitschrift issued by his Kompanieführer of Grenadier-Regi..
Soldbuch to Unteroffizier Erich Kallinich. 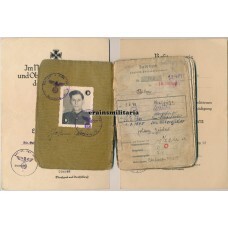 He was called up during the general mobilisation of 1939 ..
Soldbuch to Obergefreiter Alfred Imberg, born in Gelsenkirchen and living in Volmarstein. 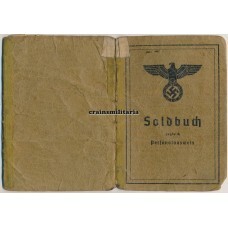 Imberg ser..
Soldbuch to Obergefreiter Heinrich Bartels. 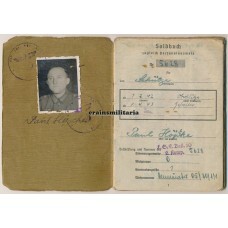 This baker was called up in September 1939 and continued..
Soldbuch to Obergefreiter Rudolf Steiniger. 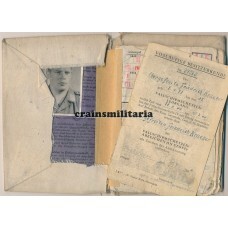 First issue opened in December 1940. 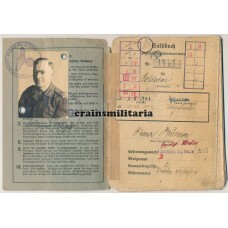 After training as a..
Soldbuch to Grenadier Herbert Eicke. 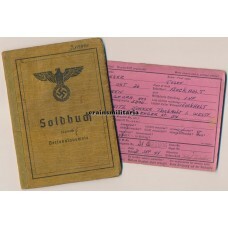 Joining the Wehrmacht in September 1944, Eicke had just been re..
Soldbuch to Baupionier Erich Albrecht from Stolp (Pommern), who served briefly with Baupionier-Ersat..
Soldbuch to Gefreiter Karl Claus. 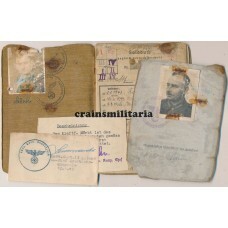 He joined the Wehrmacht in May 1943 and after some reserve Landess..
Soldbuch to Uffizier Anton Hammer, nice first issue opened in September 1939. 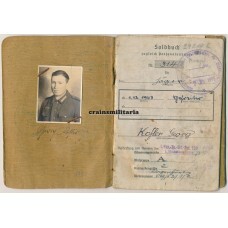 He saw action in Franc..
Soldbuch to Unteroffizier Günter Kraaz. 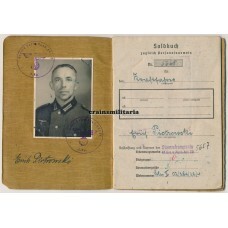 First issue from March 1940. 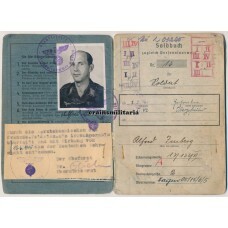 After an initial stay with Pion..
Soldbuch to Oberleutnant Tammo Schütte. 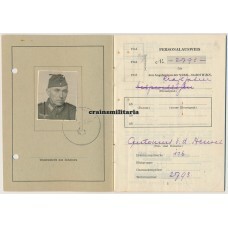 Zweitschrift issued late 1942. 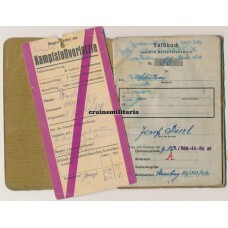 Schütte was a long time servi..
Soldbuch to Obergrenadier Johann Hatzelmann. 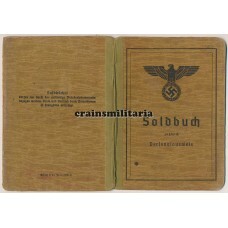 Opened in June 1942 soon after the 32-year-old Nürnberg..
Soldbuch to Obergefreiter Albert Sass. 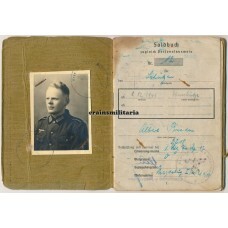 He joined the Wehrmacht on 10th of September 1939, and ended ..
DAK Soldbuch - 15. and 21.Pz.Div. 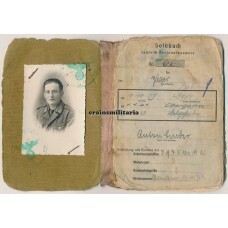 Soldbuch to Unteroffizier Ernst Angelewski. 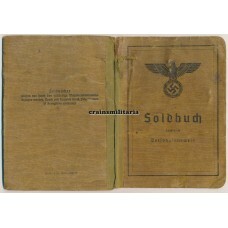 First issue started in October 1939, after which he join..
Soldbuch to Unterfeldwebel Georg Kath. 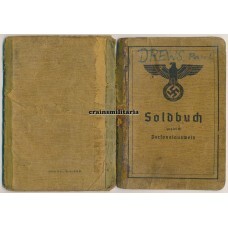 First issue started in October 1939. 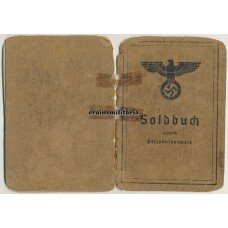 Kath first served with I..
Soldbuch to Obergefreiter Heinz Muller. 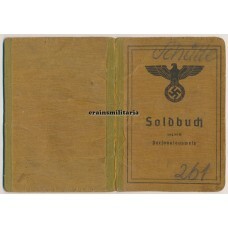 First issue from November 1939. 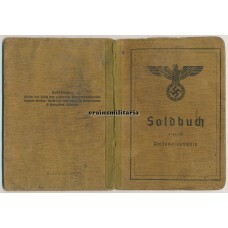 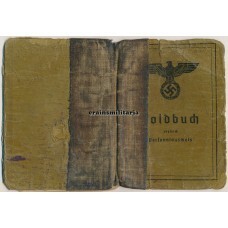 Muller started off with the ..
Soldbuch to Oberfeldwebel Josef Rauth. 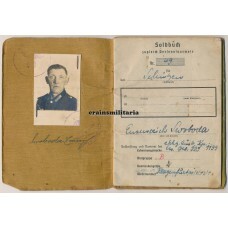 Zweitschrift issue dated October 1943, when he returned to hi..
Soldbuch to Liselotte Schubmehl, a female Reichsangestellte working with the Luftflottenkommando 3 o..
Soldbuch to Obergefreiter Reinhard Mumm. 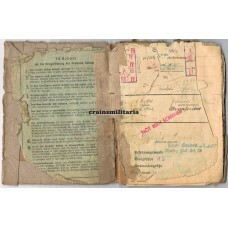 Zweitschrift issued in August 1944 while recovering from a ..
Soldbuch to Verwaltungs-Stabsgefreiter Alfred Mörbt, who served in supporting Kriegsmarine units in ..
Soldbuch to Obergefreiter Franz Lukas. 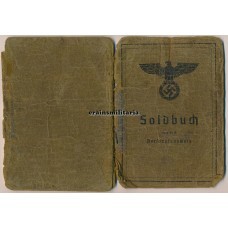 Called up as an older soldier in 1942, he was first assigned ..
Soldbuch to Jakob Boos, a front line soldier who mostly saw action with Infanterie-Regiment 188, par..
Soldbuch to Obergefreiter Ludwig Domes, who entered service with a reserve Flak unit in July 1940. 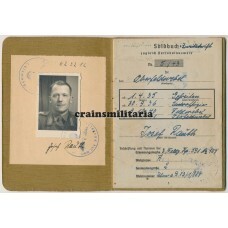 A..
Soldbuch to Obergefreiter Franz Brunner, who was called up in October 1941 and first served with the..
Soldbuch to Unteroffizier Karl Rudek. 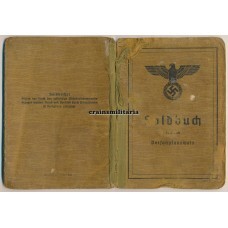 Zweitschrift issued in September 1944. 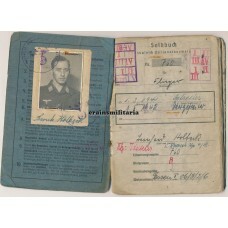 The Vienna born Austria..
Soldbuch to Obergefreiter Michel Klass, first issue opened in January 1940. 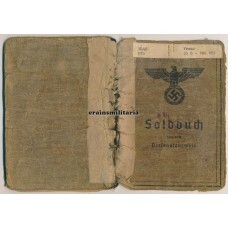 This Trier resident foug..
Soldbuch to Uffizier Otto Hörrle. 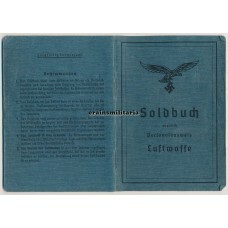 Soldbuch opened in November 1940, shortly after joining the Flak. 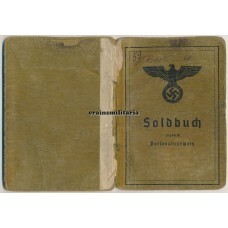 ..
Soldbuch grouping to Stabsgefreiter Julius Schmitz from Giessen. 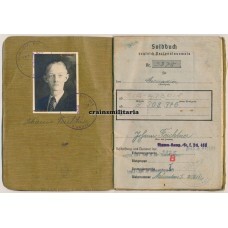 Called up in August 1939, when his ..
Soldbuch to Gefreiter Otto Stauch. 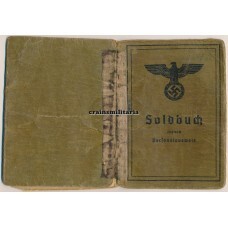 First issue from April 1940. 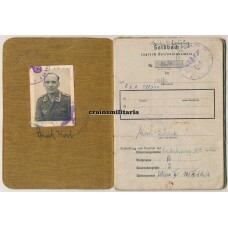 Stauch served for many years with oc..
Soldbuch to Unterfeldwebel August Keck. 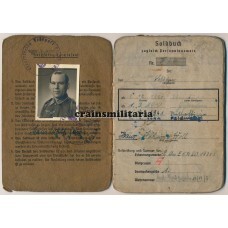 This WWI veteran was called up again in January 1944 to serv..
Soldbuch to Unteroffizier Heinrich Schröder. 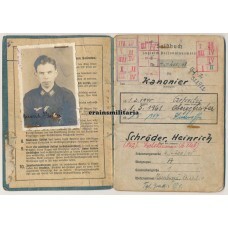 This young man from the Oldenburg area was called up in..
Soldbuch to Gefreiter Paul Drews. 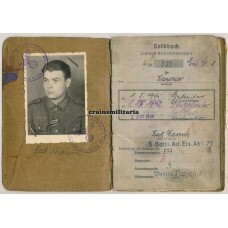 This shoe maker joined the Wehrmacht in February 1943. 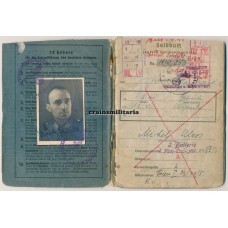 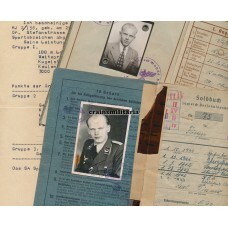 After basic..
Soldbuch to Obergefreiter Josef Braunauer. 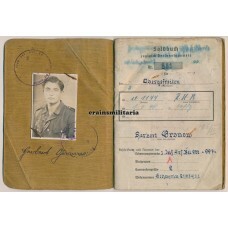 Joining the Wehrmacht in April 1942, the Austrian hairdre..
Soldbuch to Füsilier Franz Straka, a Vienna student who joined the elite Grossdeutschland troops onl..